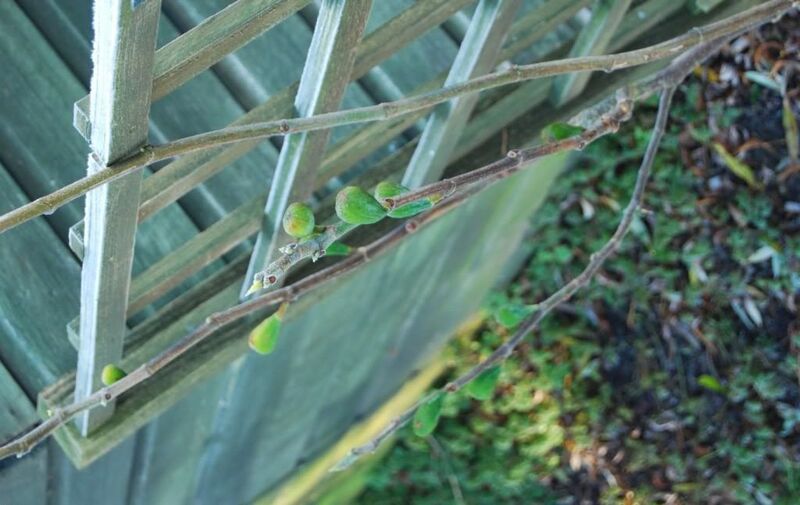 It's a little baby fig tree, trying to grow through the brutality of a cold winter. 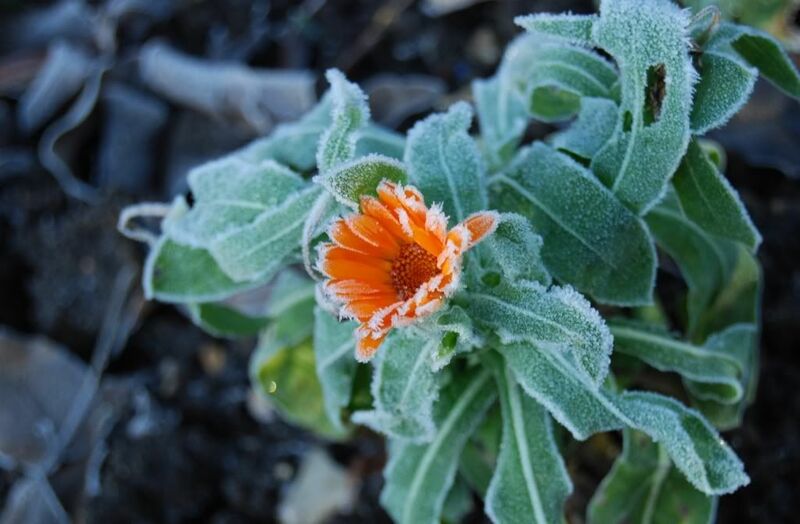 What a sweet little thing it is, and presumably doomed to failure until the warmer months. 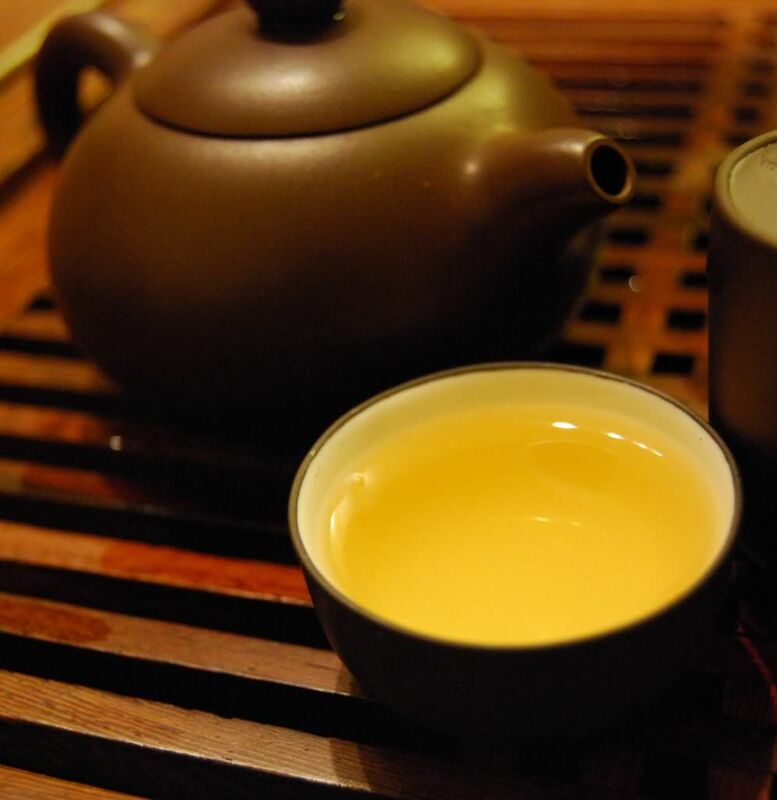 Another of my fond discoveries is the Lincang Gucha [ancient tea] company - you may remember the 2005 "Gushu Zhenpin" [ancient-tea treasured-product] that I so enjoyed before (pictured below, with its sister). Shown below, the big and dark leaves, which are somewhat fragmented, but which carry a high and quite sharp aroma - there's something of sweet leather about it. 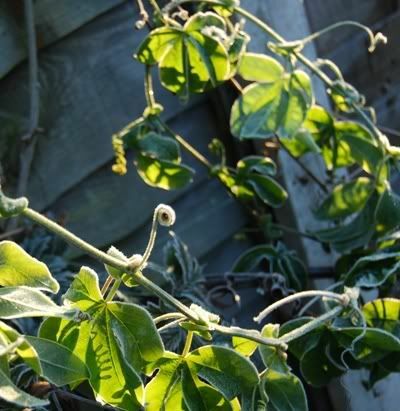 Some of the leaves have a vague red tinge which raises eyebrows. Garden-like candy in the wenxiangbei [aroma cup] makes me immediately pleased with this spritely offering, which has good endurance. The soup is shaded towards orange (pictured below), which I suspect is not entirely due to its three years of aging. 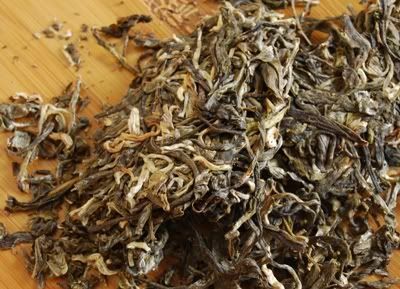 The flavour has the predicted tinge of hongcha maltiness to it, but it has plenty of sweetness atop, and plenty of tobacco below, and it all works rather well together. What a vigourous little number this is, with plentiful chaqi and cooling sensations to be had. To sum up this energetic cake, I would classify it as "candy and hongcha", which is a unexpectedly appealing combination. 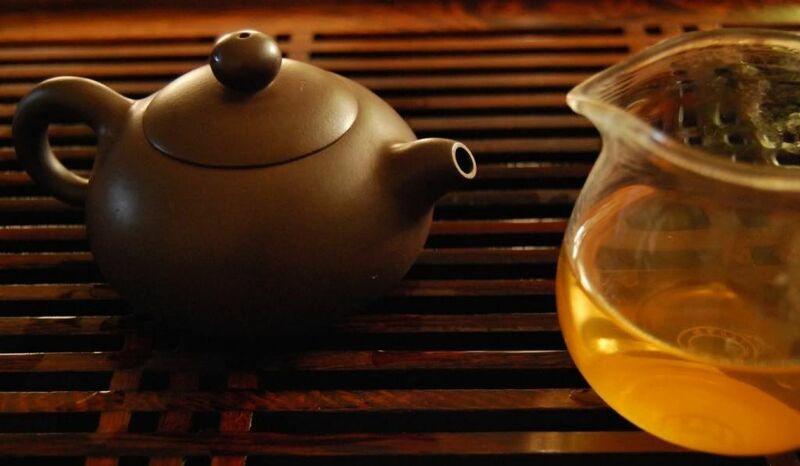 In later infusions, the sweetness of the unprocessed leaves dims in comparison to the oxidised, processed leaves, and the "red" hongcha nature takes more of a role near the end. All in all, a good tea - if you're ready to tackle the processing. And with that, a toast to 2008 - and many good teas in 2009! See you there. 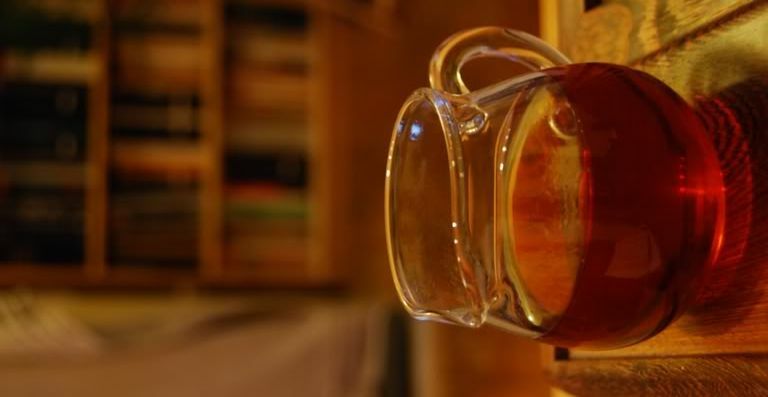 Over Christmas at home, I was drinking a delicious Darjeeling, hand-picked and generously supplied by JC. 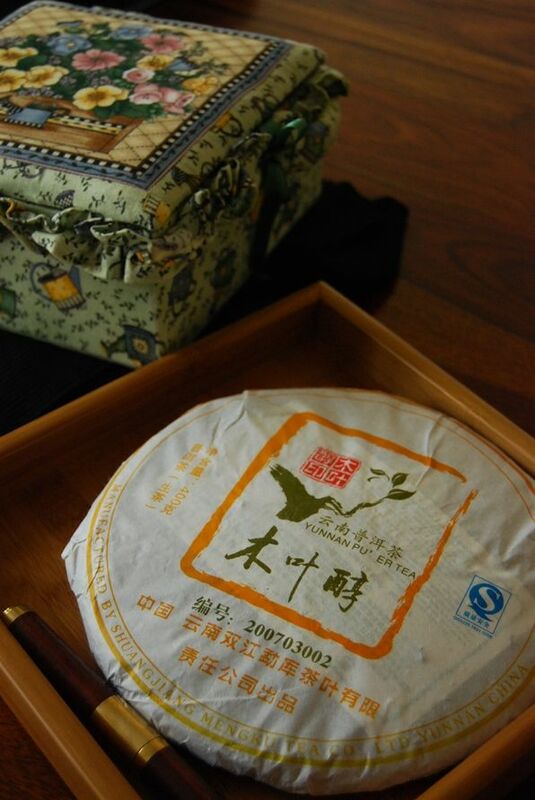 I was surprised by the rich, dark fruitiness similar to Oriental Beauty (Dongfang Meiren, or Baihao). Relaxing back in the lounge of the house in which I grew up, drinking tea from a distant friend, sharing some with my mother - great stuff. Now, a swift journey and we're back in our home city. What better way to get back into the swing of things than with a random tea, plucked from my wee collection of samples? 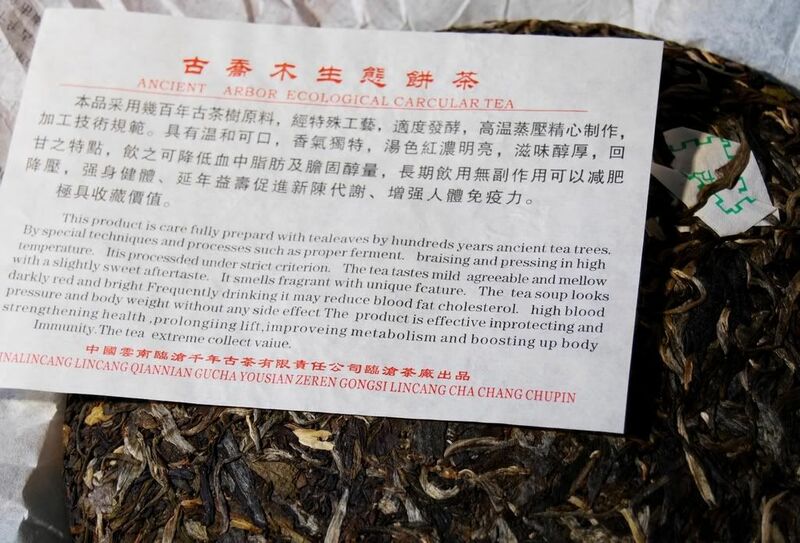 The vendor pages claim that this tea is made from Bingdao leaves, but at the $24 price, I suspect they're not going to be too far from the plantations. They do look decent enough, though, as you can see for yourself in the image below. Small, dark, and a touch fragmented, they have a cold, metallic, icy aroma - appropriately enough, given their name [ice island]. 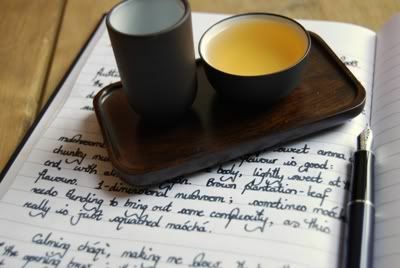 This is quite orthodox: sweetness in the wenxiangbei [aroma cup], a fine yellow brew, and a little thickness of texture. "Not bad, but simple", sayeth my dear wife, which rather sums it up. There is no obvious mintiness here (bingdao!). This excessive mediocrity of this tea is impressive: no matter how I brew it, how the water is changed, no matter which leaves are used, it remains irretrievably average. A refreshing session, but I was hoping for something just a little bit more interesting. Too sour, too simple, too average. May the good Lord deliver us from average tea in 2009, amen. It's Christmas time for sure, but I wasn't expecting such generous gifts as were recently given by ST, including (pictured below) a Nanjian tuocha from the 1980s. What better way to get into the festive spirit than with some delightful tea given by a friend? 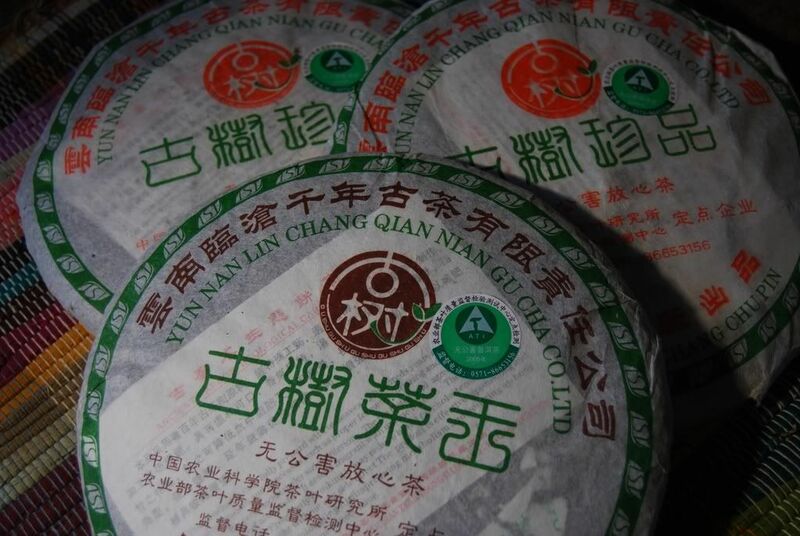 Prior to 1998, Nanjian made tuocha since their founding in 1983, sited not a million miles away from that mightiest of tuocha manufacturers, Xiaguan. 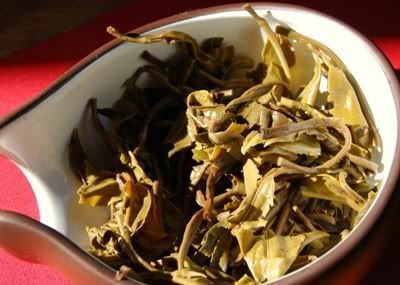 Shown above and below, the copper-coloured tips mixed with fragments of small leaves remind me of shupu, and the aroma is a distant, gentle woodiness. ST has stored it well, and the compression is relaxing a little as it begins to breathe. Following ST's suggestion, I use fewer leaves than I would otherwise, and brew it gently. Greeted with a rich, red soup, the aroma is surprising: while it has the smooth cedarwood nature of well-matured shupu, there is an undercurrent of direct sweetness, which explodes in the lengxiang [cool-scent, the aroma in the aroma cup as the cup cools] giving a strong caramel character. This must be the shengpu speaking. 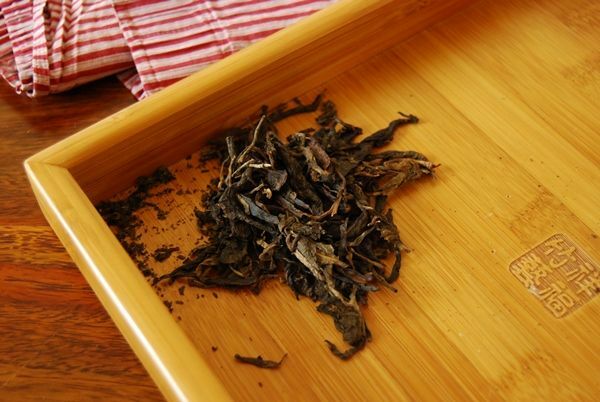 That lengxiang endures, giving me confidence that the leaves have not been aged into nothingness (as so often occurs with some old maocha), but rather that they retain their vigour. The soup itself is a creamy, cedarwood affair, with the particulate nature I associate with shupu. As with some of those fine old shupu bing that we rescued from my wife's home-town, this is extraordinarily smooth, like thin silk. 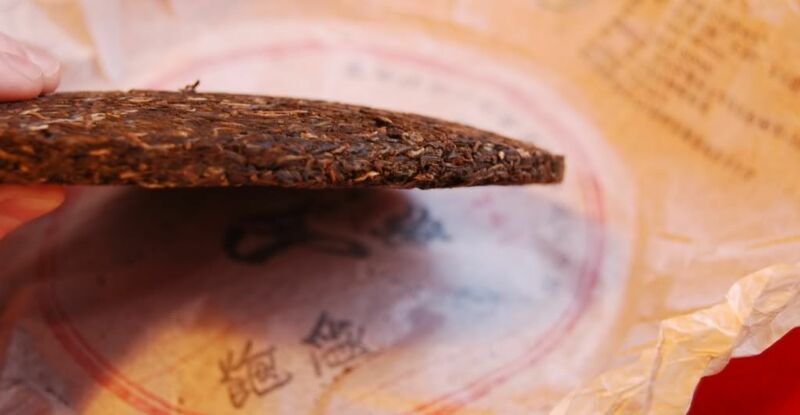 The shengpu wraps itself around the consistent shupu core to provide some depth and challenge, swelling in the throat to a crescendo of sweetness and mouth-watering vanilla. It's quite a work-out. My eyes are opened, and the cold, wintery morning suddenly seems excessively bright. I drink this into mid-morning, then pack the weary leaves into a container to take to my office, where they undergo some hour-long infusions to coax out any remaining flavour and chaqi. Well, then, time to depart for "The Other Place" (Cambridge) for a family Christmas. Special thanks to ST for such a charming gift, and my best wishes to all readers for the coming Christmas period. Make it a good one. 2008 Shuangjiang Mengku - Muyechun "Laoshu Qingbing"
This tea is highly inexpensive. 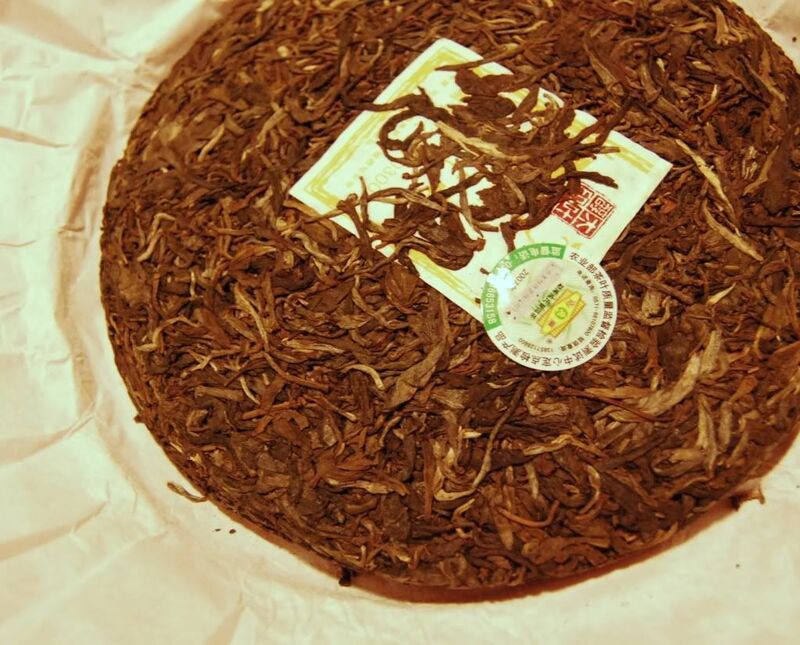 I do wonder if Shuangjiang Mengku could do with putting out the odd "premium" cake, but this laoshu-style [old tree] cake is about all they do. 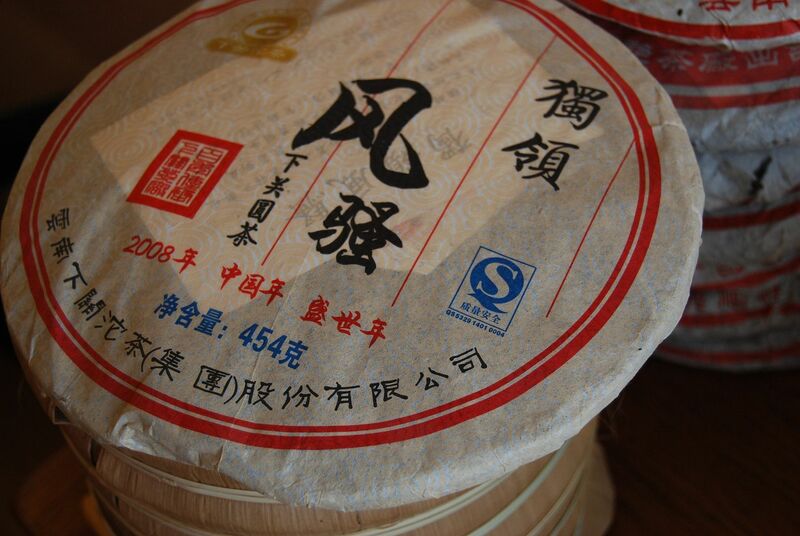 You will remember the 001 and 002 from last year, and both ST and Yunnan Sourcing have referred to a mysterious "003" production that I have not yet seen. Below, the now-familiar pretty branch that signifies the Muyechun output. 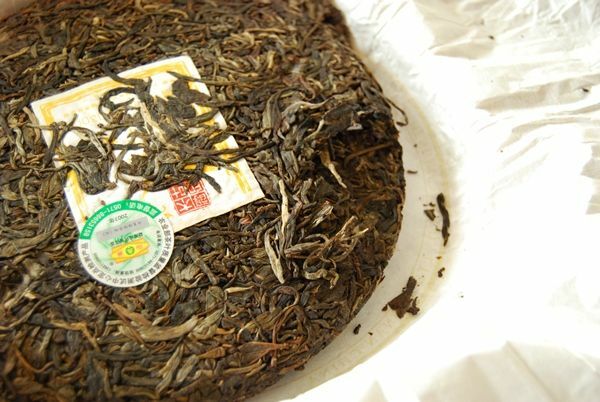 Leaves for this tea came from the first flush of 2008, from the Yongde region in which the Muyechun factory is situated, with a "high percentage" of laoshu leaves. steam and knead it in a loose state ready for use." I won't be doing that, but it's an interesting idea. Given the loose compression, it doesn't seem entirely necessary. 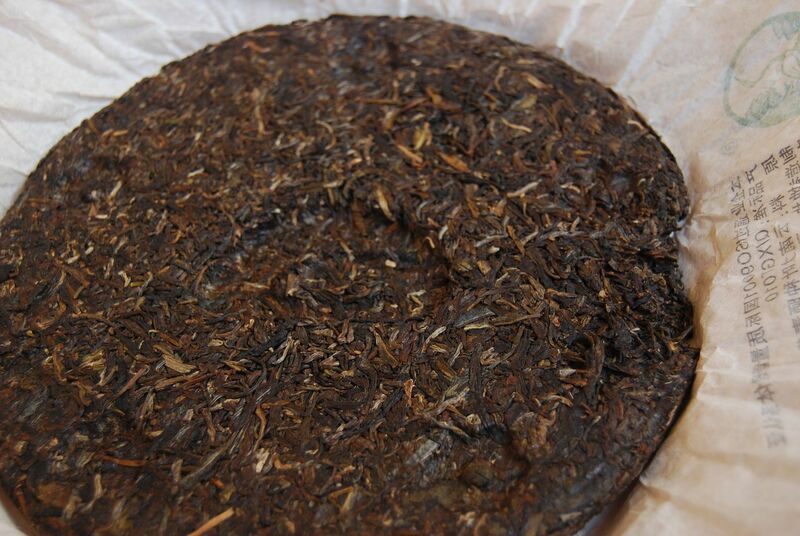 Shown above, a chubby 400g bing with large leaves of all colours. The aroms is quiet, but is sweet and pleasant - green, candied, with a little spiciness. Reticent, you might say, if feeling kind. Underpowered, if feeling less charitable. This is a sweet one. I shouldn't be surprised, given the ludicrously sweet 2007 teas from the same producer, but it is quite something. 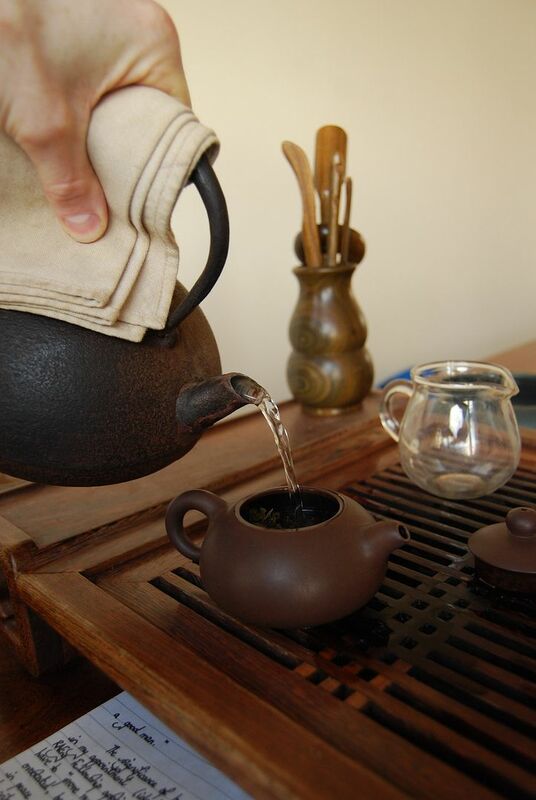 The aroma in the wenxiangbei is white sugar, then, instantaneously, sugary darkness - as if a switch had been thrown. It is a highly acrobatic aroma. While "low" in the pitch of its flavour, it is reasonably smooth. The first infusions are understated in texture, flavour, and huigan, but this develops satisfactorily by the third brewing. Creamy and sweet, in correspondence with its tippiness, I rather like it. 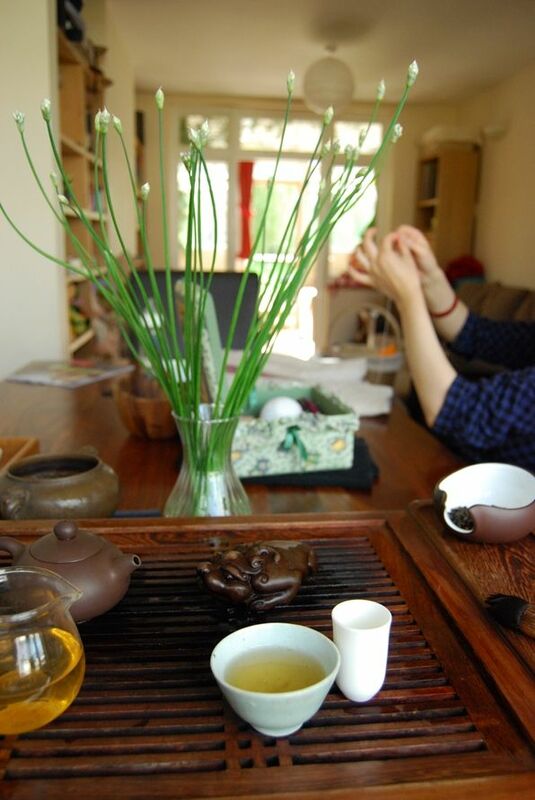 Unlike the vapidity of, for example, dancong, this is a conversation with an amiable sort with a good sense of humour. It keeps me entertained, and isn't something from which I'd require too much. Perhaps, if I were looking for stable tea for immediate consumption, I might buy more of this. However, while pleasant, it doesn't thrill me with possibilities for the future, and I am fortunate to have more than enough tea for immediate drinking. One cake is definitely enough. 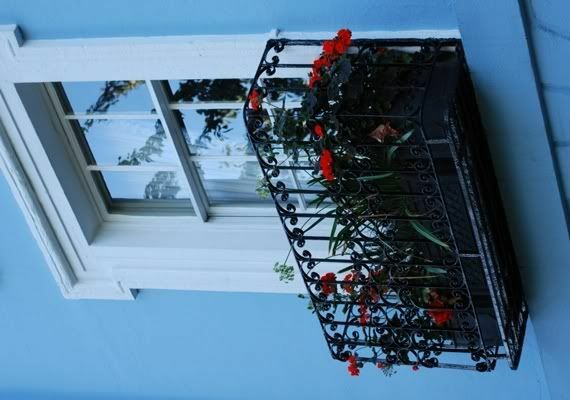 This was inexpensive in 2008, and I found it to be particularly sweet. 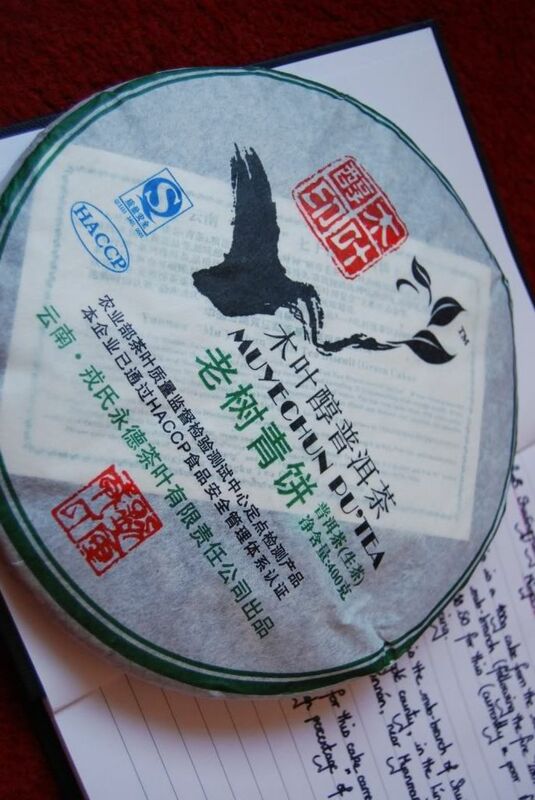 The maocha comes from the Yongde region. 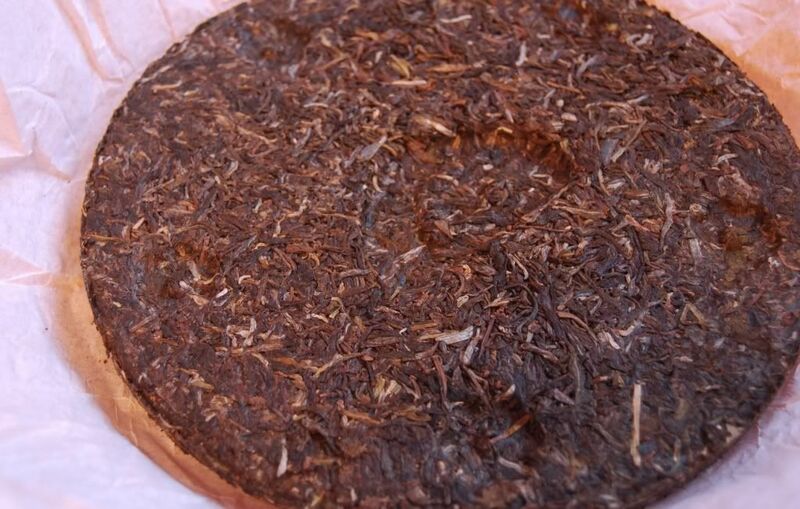 The leaves are quite large, giving the cake a pleasant appearance. They have a sweet and humid scent that gives me hope. The rinse has the sweet, "dry" scent of other cakes from Lincang diqu. In 2008, I questioned the aging potential of such a sweet cake; six years later, I may now test that assertion. 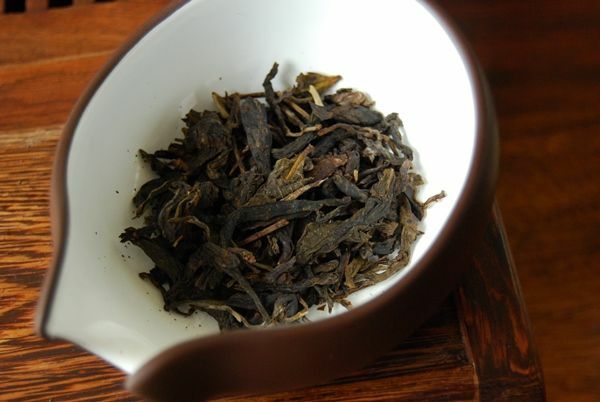 The wenxiangbei has a big, husky, and fruity aroma. There is a strong component of "purple" sweetness in the main body of this tea, but there is, happily, a solid Lincang base of grain. Muyechun is always accessible, and it seems that this cake is another attempt to dress up "real" pu'ercha with lighter components. It is quite strong, but has not aged quickly: the soup is yellow-orange. By the third infusion, the purple sweetness has faded and we are left with straightforward, and rather basic, Lincang tea. 2008 Puerh Shop - Meiguohao "0801"
More winter chills settle on the garden. 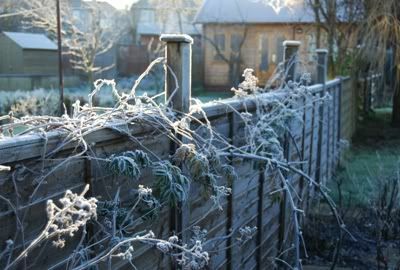 By the standards of some readers' environments, I'm sure the English winter is tame - but for us, it's brutal. 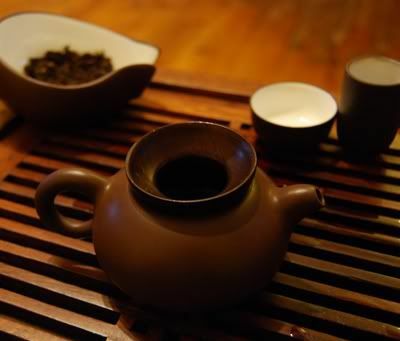 Let's get cosy with Puerh Shop's "Meiguohao". I am unashamedly biased: I love home-made (or hand-selected) cakes. I loved the 2007 Daxuashan from Maison des Trois Thes, I loved the 2008 Nadachayuan "Chachanyiwei". I even have a soft spot for those silly commemorative cakes, made as special-runs from the large producers. Home-made is great. 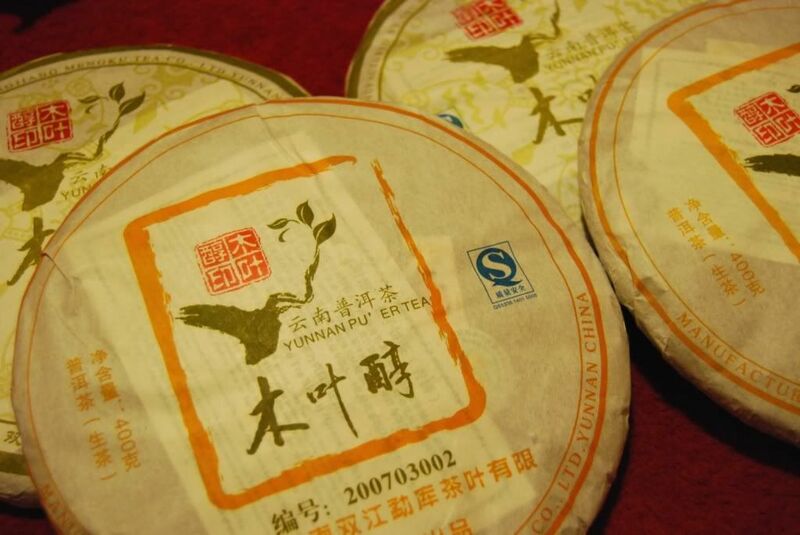 The vendor description reads, "These are our finest pu-erh teas, definitely the premium class reserved for collectors and true tea drinkers." 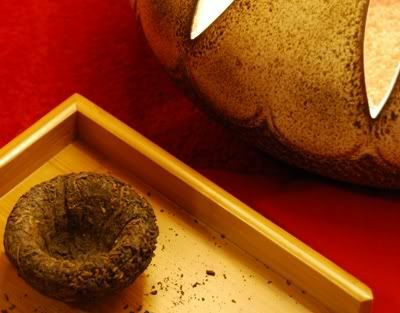 I admire Puerh Shop's humility! It's tempting to think so. However, the name "Meiguohao" [America Brand] sticks in the gullet like a painful fishbone. There is something uniquely unpleasant to me about products named with some sort of phoney nationalism. I'm sure this is a character flaw on my part. 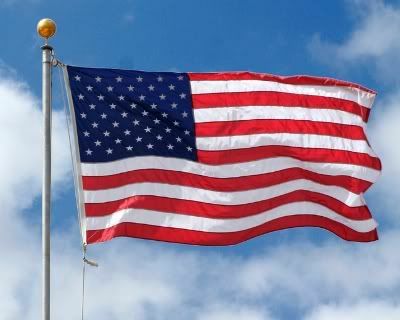 I walk the aisles of Chinese shops and see product after product with the stars-and-stripes on, or sometimes the British flag, or even the German flag, and it makes me sad. For the English, the act of naming something after the nation, or even putting an image of our flag on a product is rather uncomfortable. It's approximately as bad as naming tea after a banking plaza, or calling it (you guessed it) "scholar tea". Gnnhhhggnnng. However, 'tis the season to be jolly. Forgive and forget, that sort of thing. 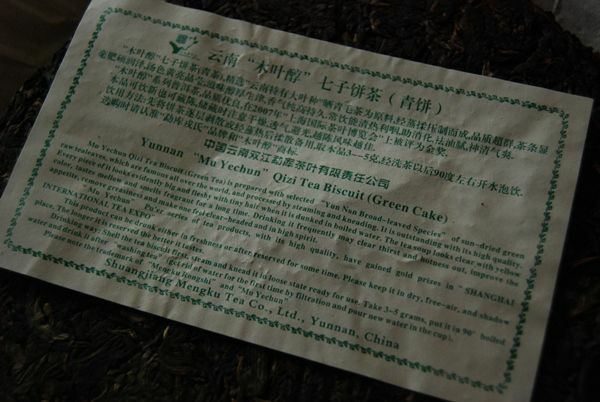 I wonder if that bias induced by the tea's name balances out my bias towards hand-made cakes? The compression, shown further up, is very loose, and the leaves look sumptuous. Lots of silver fur is to be seen, and the Mansa leaves are well-handled, large, and mostly whole. If the first bite is taken with the eye (see ranting above), the second bite is taken with the nose, and it is infinitely more palatable. Quiet, but sweet. Into the mouth, and the magic is dispelled: the cloudy brew is thin, has the character of chunky mushrooms, and is devoid of any huigan. By the third infusion, the single tone of mushroom has left me bored, and I am looking out through the window planning my day. 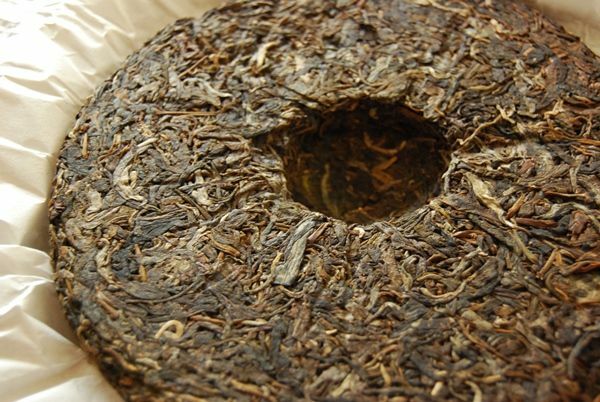 This is good, fresh maocha, but that's really all it is: maocha, squished into a cake. 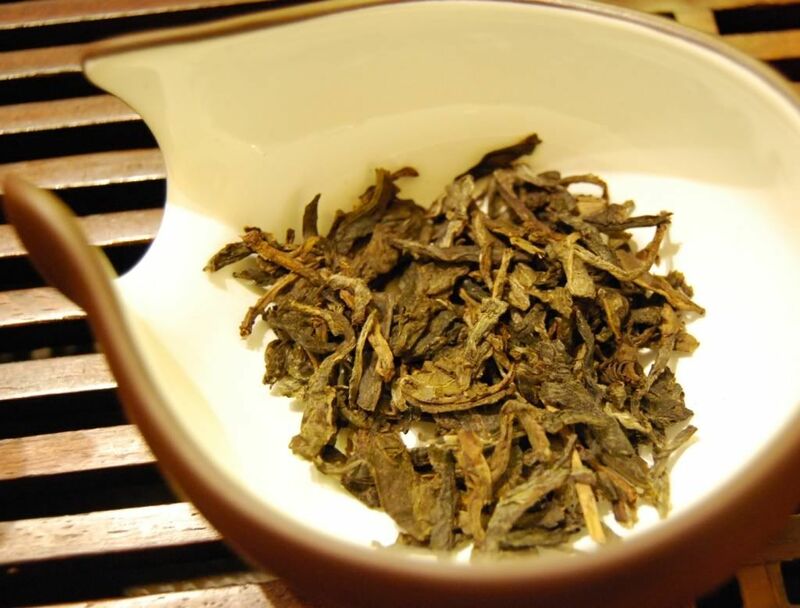 For monochrome leaves such as this, with no complexity to be found, the tea has to be blended in order to give it some character. 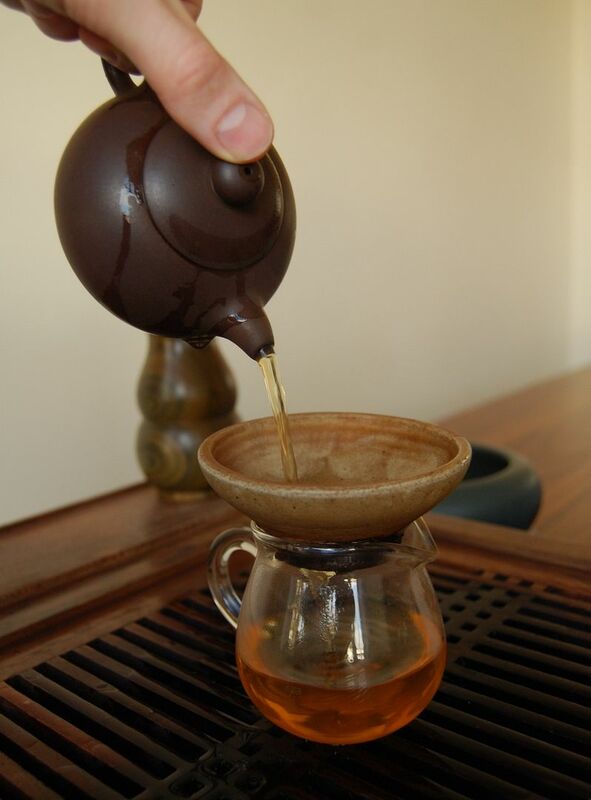 This experience is absolutely akin to drinking 1-dimensional maocha. So, I started excited at the prospect of hand-made tea, became sad when looking at a packet that sports a badly-printed image of the stars-and-stripes, became happy again at the sight of the leaves, but, ultimately, became bored by a simple mushroom tea. 2007 Shuangjiang Mengku - Muyechun "002"
Winter is here already, and it feels as if I didn't even get a proper opportunity to say goodbye to autumn. The seasons are whizzing past, mostly unmarked, as I have my head buried deeply in my work. I'm looking forward to the light at the end of the tunnel, in the New Year. 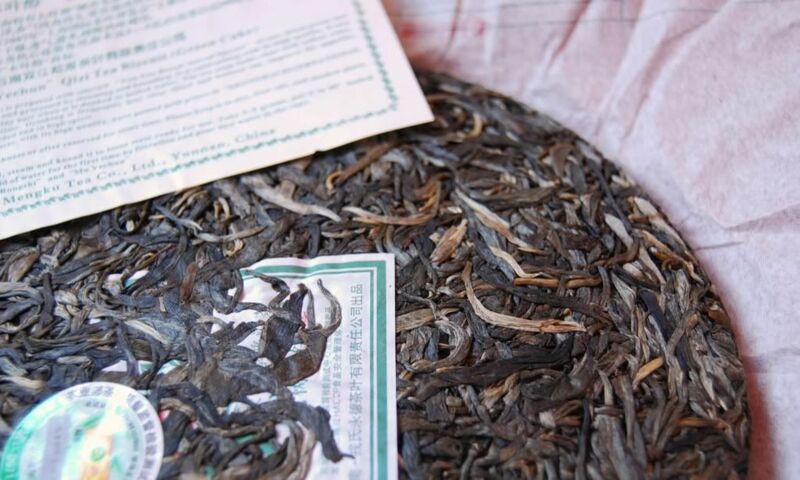 To see off these wintery mornings, I reach for a cheering, friendly tea: the 002 from Shuangjiang Mengku's Muyechun label, the exclusive output of their Yongde sub-department that was set up last year. Readers with good memories might recall my pleasure at encountering the simple, sweet joys of the 2007 Muyechun 001. As pictured below, this cake has fewer tips than its 001 sister, but consists of small, springtime growth. The aroma is reserved, but what there is to be found is gently sweet, and candy-like. More simple, candy-sweet charms in the mouth, yet mixed with a lower, "brown" characteristic, that I associate with plantation leaves - that ever-so-slightly ragged roughness that sometimes accompanies young leaves. The lower flavours of larger leaves continue with some notes of root-crop flavours. Oddly enough, this tea is noticeably cooling in its sensation - as if I had just eaten a mint. Fresh! I wasn't expecting such good leaves to have been used in a fun-while-it-lasts cake, and am pleasantly surprised. The chaqi of this cake is very good: it lifts me up and brightens me, but at the same time soothes and calms me. I can see why tea was a hit with Chan monks. Simple, sweet, with some broad, lower notes, this tea is lifted above the herd by its pronounced cooling sensation and excellent chaqi. The huigan is more of the candied sweetness. For not much investment (~£8), this is a friendly, amiable affair. I often liken my tea sessions to conversations. This one is a young girl with some education - a pleasure to talk with, and enjoyably light. Brrr. Say you what you will about the quality of the writing at the Half Dipper, but you can't contest the fact that my photography used to hurt the eyes. 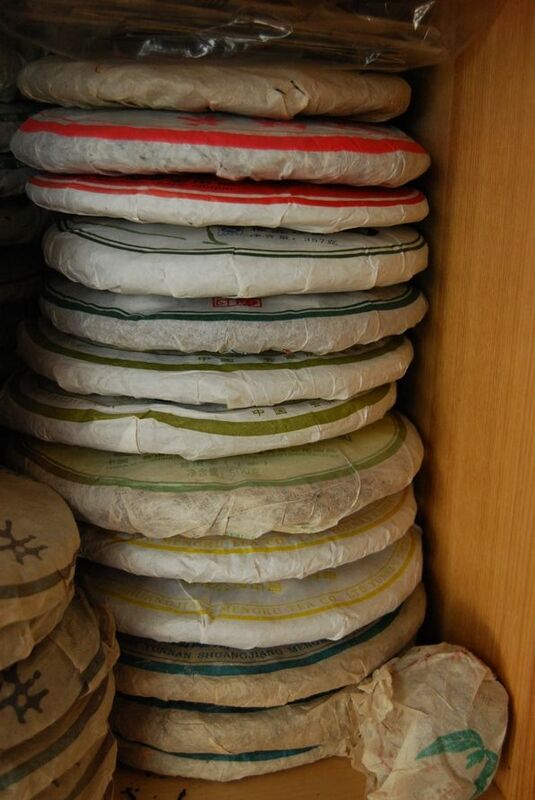 Let's bathe our eyes with some relieving images of bingcha stacks. The Stacks extend life; the Stacks expand consciousness; the Stacks are vital to space travel. My old Muyechun was a humble cake. I rather liked it, back in the day, and squirrelled away some random cakes in the Stacks, to see what would happen to them. They've moved around the city as Lei and I have migrated from being Mr-and-Miss, to Mr-and-Mrs, to Mr-and-Dr, until parity was eventually achieved. Honestly, the last time that I drank this tea was when I bought it. This is, amusingly, a common tale among my cakes. I'm buying lots of tea, but most of it only gets tried once, until I remember that it exists and try to find it again. 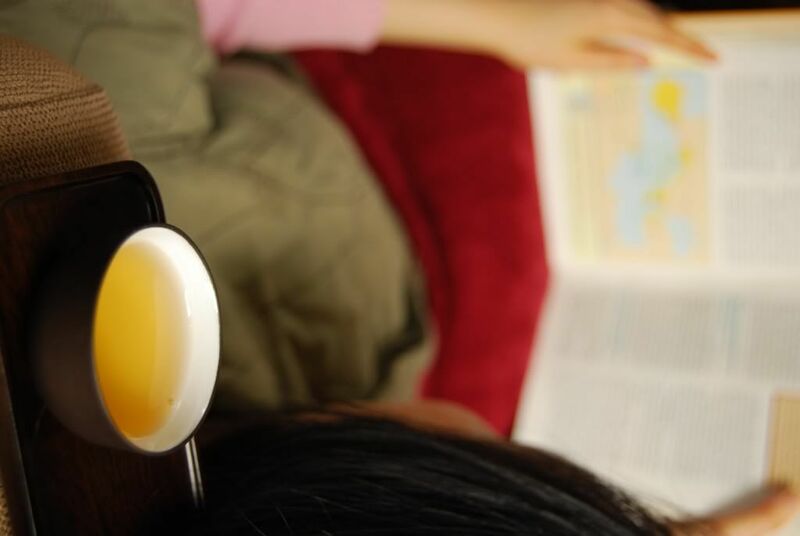 The Stacks facilitate this process of losing tea. Originally, my Muyechun 002 (moneypenny) was green, fresh, and not dissimilar to other major labels, such as Dayi. In the interim, much has changed. The leaves give off a mighty aroma of pungent humidity when I teasingly denude the cake of its wrapper. England is by no means "wet storage", but it certainly smells undry. Jemmying some leaves from the bing releases further pleasant scents. 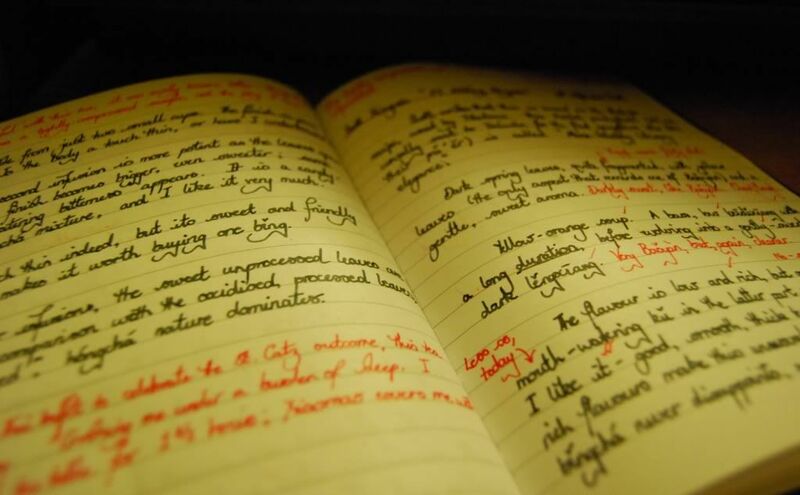 "Darkness and dense sweetness", I seem to have put down in my journal. I'm glad that I plumped for the 002, rather than for its lightweight sister, the 001. I am still reminded of ST saying that the 001 was "popular with the ladies", which makes me laugh aloud even as I write this. I can very easily imagine ST putting on a "Ladies' Night", and serving 001, along with a few male strippers. 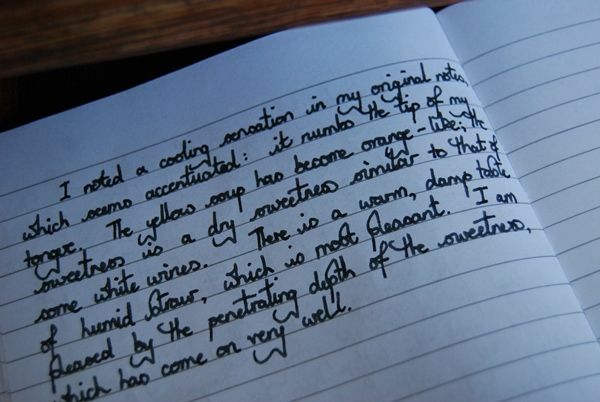 I noted a cooling sensation in my original notes, which now seems accentuated: it numbs the tip of my tongue. The yellow soup has become orange-like; the sweetness is a dry sweetness similar to that of some white wines. There is a warm, damp taste of humid straw, which is most pleasant (despite the fact that it sounds dreadful). I am pleased by the penetrating depth of the sweetness, which has come on very well. "Yes, this is very good", notes my dear wife, after a cup. 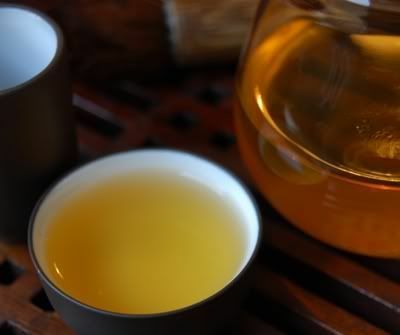 The tea opens into a solid, sweet, and refreshingly "dry" series of infusions - dry in the sense of the tannic dryness of some grapes, rather than the storage. 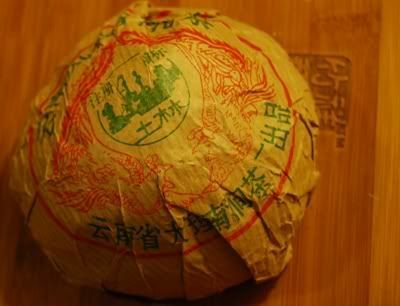 My efforts with acquiring more of this cake from Western Yunnan Tea seem to have failed, but this merely redoubles my motivation to tackle the Bao-Which-Is-Tao once more. It is commonly available, and inexpensive, and I'd like to own more of it, if it tastes like these English versions. 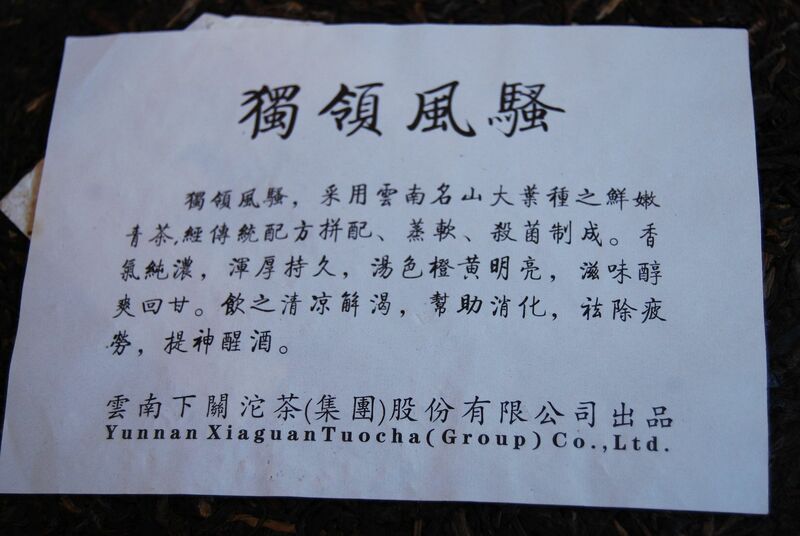 2008 Xiaguan - FT "Duling Fengsao"
I wrote previously about a resurgent Xiaguan, and this is a good example from their now-excellent FT (Feitai) brand. I suspect FT now has less to do with making gangsters in Taiwan happy, and more to do with demonstrating the Xiaguan premier teas. 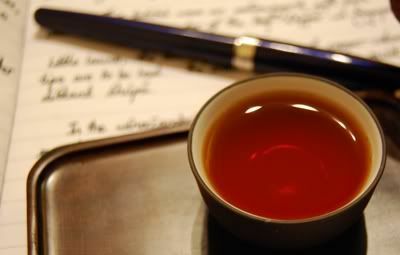 "Duling fengsao" is "alone-leading literary elegance", which does have overtones of the dreaded "scholar tea". The bing is iron-compressed. This being Xiaguan, I was expecting the compression on their tiebing to be exceedingly brutal, but, while it is thin (see below), it is quite easily separated. 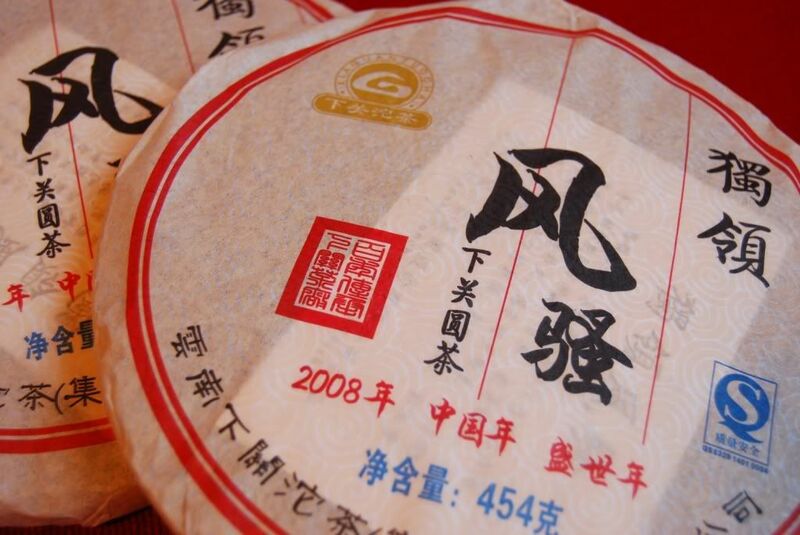 If you are, like me, a fan of Baoyan bricks, then this tea is The One For You. 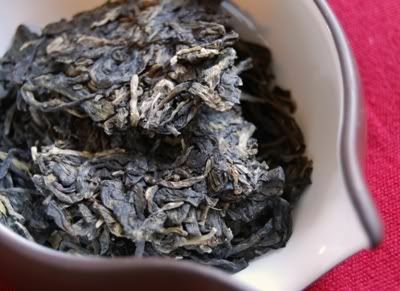 It is based on the Baoyan recipe, but uses good-quality leaves. If there is anything to be said against the charm of the lovely Baoyan brick, it is that they're a bit rough - though the ruggedness is undoubtedly part of their charm. 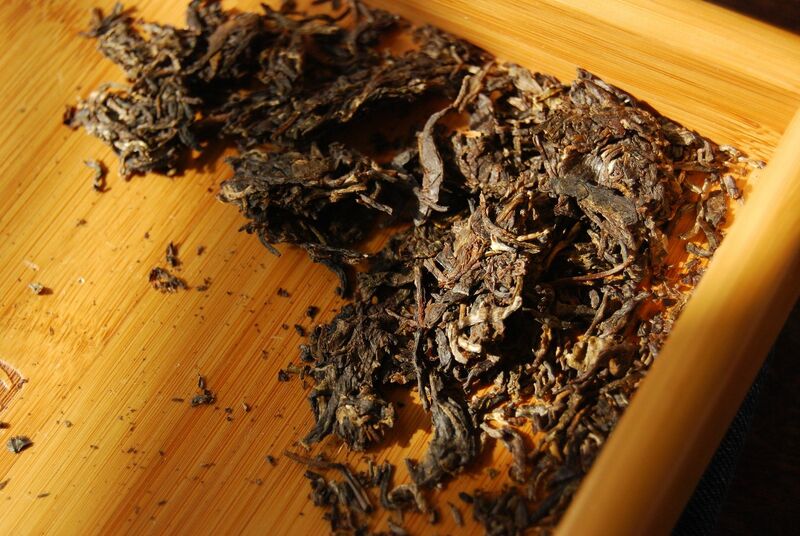 The leaves give the game away: dark and sweet, they have the precise aroma of Baoyan leaves. This makes me happy. Since moving into our new house, a cat from the neighbourhood appears to have adopted Lei and I as new servants. He waits for me when I return in the evening, and watches me put away my bicycle, while mewing loudly, then sits by the door ahead of me with an expectant look on his face. Pictured below, His Royal Fatness perched on a makeshift bed that we have set up for him, consisting of a pink rug on a chair. 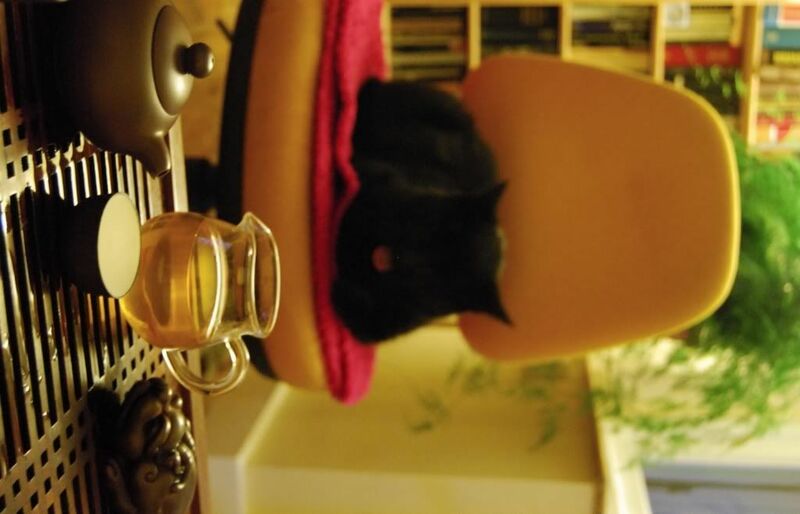 He likes to watch me drink tea, and purrs for hours on end. We have named him "Heidu" [black belly], or, on occasion, "fatman" or "your chunkiness". His rug/chair arrangement has been dubbed "The Palais de Fat". The soup is, just like Baoyan, yellow-orange. 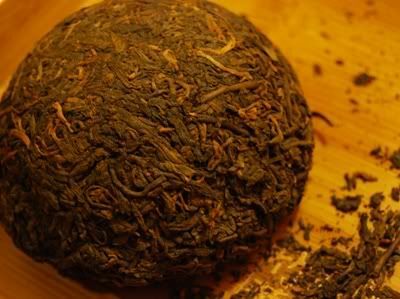 Just like Baoyan, it is a dark and flavoursome brew - and yet, against all the odds, it appears quite well-named: it is elegant, being gradual and charming. 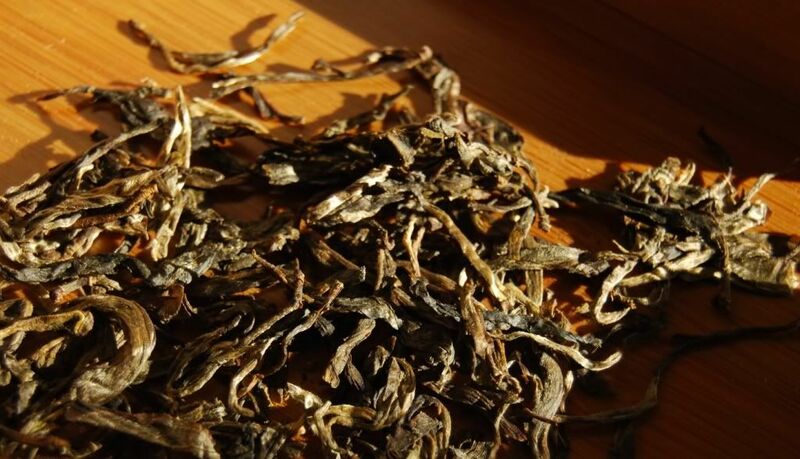 With all the flavour and character of Baoyan, it delivers it slowly and gracefully - rather than the brusque rollercoaster of the Tibetan bricks. I love it. 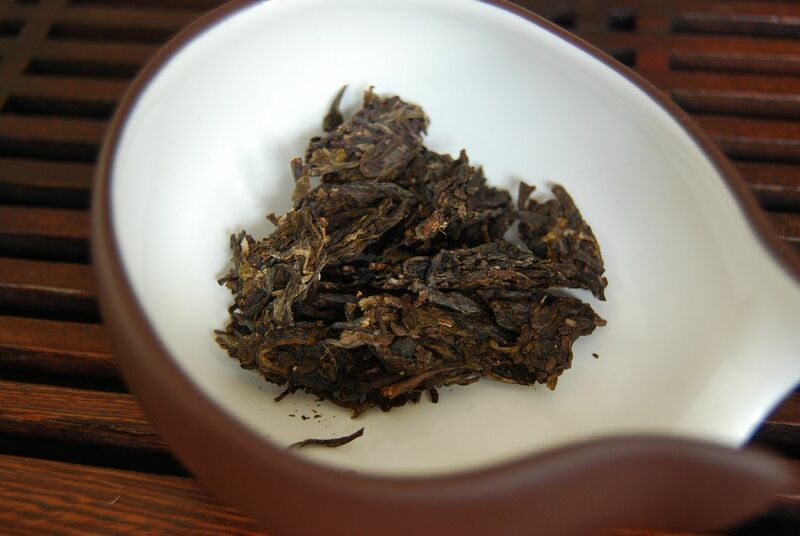 The Baoyan darkness is balanced against a fine ku in the finish, and it has plenty to reveal. It pays to be restrained in the quantity of leaves used for brewing. Top stuff - thumbs up, Xiaguan. The price of these Xiaguan cakes has tripled, which is quite surprising, in comparison to the other basic 2008 Dayi cakes that I have been retasting of late. My main concern with Duling Fengsao was that it has been significantly "darkened" in the modern Xiaguan manner, reminiscent of high-quality Baoyan (if such a thing can be said to exist). Will such a genre of pu'ercha age properly? This cake seems as fragrant today as it did in 2008, when I first bought it. I have two of these cakes, perhaps more as an experiment than anything else. The cakes were actually untouched, which leads me to the surprising conclusion that I probably bought these cakes without trying them first - it is hard to imagine me doing so today. Despite the high compression, this tiebing [iron cake] separates out into its constituent leaves fairly easily. The leaves did not start off as "green" as the Dayi cakes with which I have compared this, but nonetheless have darkened substantially. Its fragrance remains decidedly "black", and the modern Xiaguan processing seems rather more "baked" to my nose than it did back in 2008. I wonder if the mystery processing step involves heat, and lots of it. As with my Dayi cakes, this Xiaguan cake has converted much of its original, brassy kuwei [good bitterness] into heightened sweetness. This cake is now surprisingly sweet! 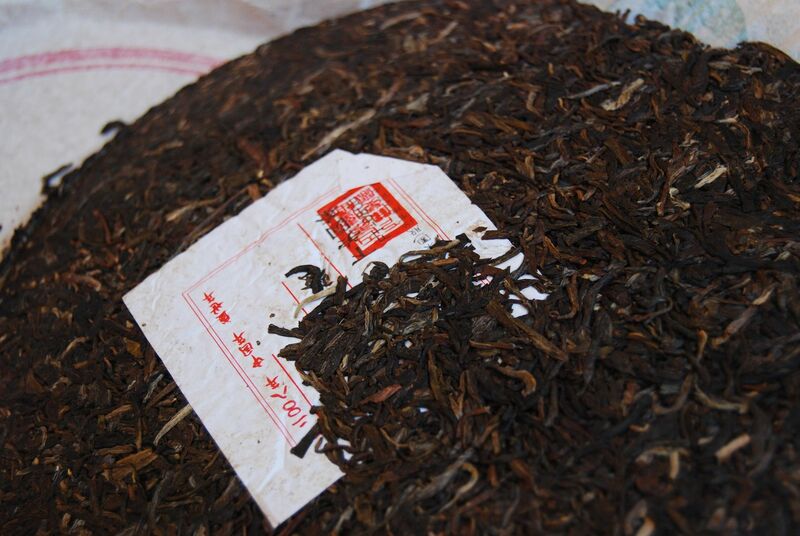 The Baoyan processing remains, but is now an interesting counterpoint to the central, penetrating sweetness. The body is solid, and it feels well-made. 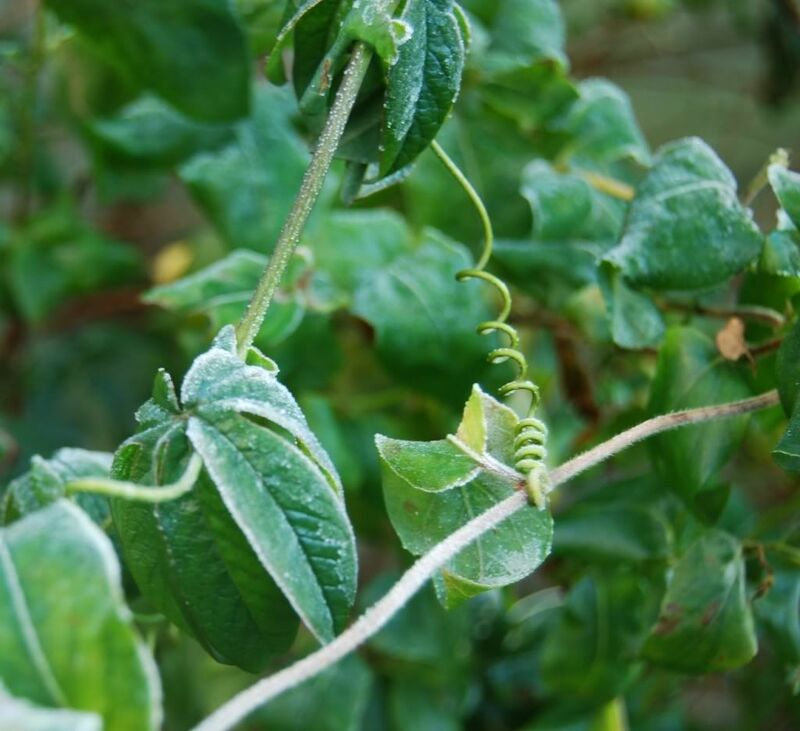 The cereal base of Xiaguan leaves is an old favourite of mine. Delicious, and highly encouraging. I conclude that even Xiaguan "blackness" can age well, given a good start and good leaves. 2008 Menghai "Peacock of Mengsong"
2008 Menghai "Peacock of Menghai"